Auraria Clothesline Project in the Tivoli Student Union. 2018. The Clothesline Project started in 1990 in Hyannis, Massachusetts when members of the Cape Cod's Women's Defense agenda were in the process of discussing the parallels between the lethality of the Vietnam War and that of domestic violence; 58,000 soldiers were killed in the Vietnam War and 51,000 women were killed in the US that year as a result of domestic violence. Desiring to raise awareness of this staggering parallel and the realities survivors face daily, the members erected the first Clothesline Project consisting of 31 shirts. In the last 18 years, the project has grown to a worldwide movement representing 6 types of violence committed against persons of all gender identities and expressions, racial identities, and sexual orientation. 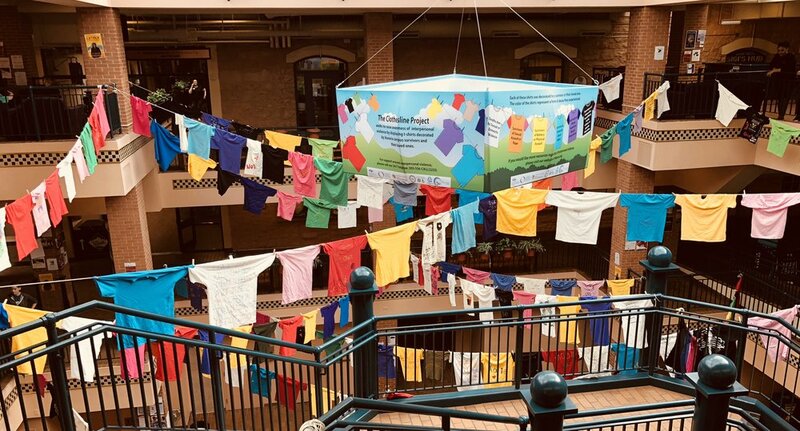 The Clothesline Project has been installed at Auraria each April for the past 6 years and is a beloved project marking Sexual Assault Awareness/Activism Month. On this year's clothesline there are 257 shirts created over the last 4 years by survivors and allies connected to the Auraria community. Our clothesline project utilizes color coding to represent 6 types of violence community members have experienced. We have endeavored to represent all identities in our project and are committed to an intersectional representation of violence in our community. This year will be the first year the Clothesline Project makes its way to CU Anschutz! The Clothesline Project will be visible in the Student Community Bridge and the Health Sciences Library during the month of April. A small display explaining the project will also be available in Building 500. Want to contribute a shirt to the project? Auraria: Come visit the Tivoli Atrium March 26 - 30th, 11a - 2p to paint shirts with the PCA. Additionally, you can come directly to our office in Tivoli 259 or visit the Institute for Women's Studies and Services in 9th Street Park. Anschutz: Come visit the Student Community Bridge during the lunch hour March 26 - 30 or stop by the PCA office in Ed 2 North, Room 5232. You do not need to identify yourself as a survivor to participate in the project. Additionally, if you find the installation or the act of participating to be triggering in any way, crisis counselors are available on a drop-in basis in the PCA or on our 24/7 helpline - 303.556.2255.